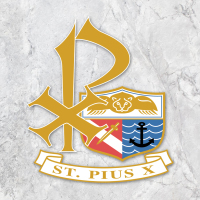 St. Pius X Parish Family is a reflection of people with courage, enthusiasm, prayer and self-sacrifice. As we look back on our history and look forward to our future, we see the times change and we ourselves must change our way of seeing. This encourages us and gives us confidence to continue in our faith journey. By our faith, we are challenged to serve the people of God, to bring alive the Body of Christ within them. Here at our parish we have many ministries run by faith-filled people who share their time and talents for the spiritual growth of our families. As a faith community we encourage one another to be alive in our faith and to never feel isolated, to feel the strength of belonging to a community and to share its values and goals. We invite you to review our ministries, service organizations and social groups with care. Catch from it the vision of what is possible if you get involved. Our God is Lord of the future, not just the past and the present. Lord God, you alone are the source of every good gift, of the vast array of our universe, and the mystery of each human life. We praise you and thank you for your great power and tender, faithful love. Everything we are and everything we have are your gifts, and after having created us you have given us into the keeping of your Son, Jesus Christ. Fill our minds with His truth and our hearts with His love, and in His spirit may we be bonded together into a community of faith, a parish family, a caring people. In the name and spirit of Jesus, we commit ourselves to be good stewards of the gifts entrusted to us, to share our time, our talent, and our material and spiritual gifts as an outward sign of the treasure we hold in Jesus.